Renowned Melbourne beat-smith and sound designer Spoonbill, aka Jim Moynihan, is back from inter-galactic scavenging with a new 3-track EP of tropical steampunk electronica: Astro Archipelago. It's a hyper-catchy digital amalgam of brass, keys, harmonica and guitar doing dirty things with synths and bass to make you shake your booty. 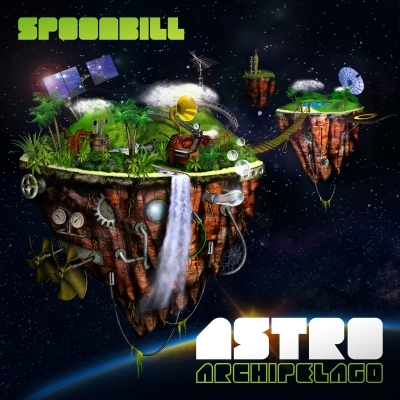 Astro Archipelago features Spoonbill’s playful signature cut-up sound, with a galaxy of funky melody pushed to the fore. The album originated from Jim's work with interactive games lab Current Circus, making dynamic compositions for their groundbreaking new virtual reality game Beat Booster. Players move their whole bodies to control their avatar that in turn creates mad futuristic beatscapes. On Astro Archipelago Jim takes those same sounds and turns the equation on its head: it's his mad futuristic beatscapes making bodies move on dance floors across the world. The album kicks off on a small tropical island - think hang drums, palm trees, lapping water and a growing sense of an interstellar voyage. The tune increases thrust, until the whole island blasts off into outer space with an ecstatic scream. From there it’s a journey to new worlds of future funk and crunky bass with more than a passing nod to the heyday of sci-fi funk FX. It’s Jethro Tull reincarnated in the body of C3PO. It’s Jabba the Hutt’s band playing Burning Man. It’s a joyous and quirky intergalactic broadcast from the future of both music and game design.